THE MIKE ALSTOTT FAMILY FOUNDATION GIVING THANKS TO LOCAL HEROES, BOTH BIG AND SMALL, DURING THIS THANKSGIVING HOLIDAY! This Thanksgiving week, Former Buccaneer Mike Alstott and the Mike Alstott Family Foundation, will once again provide Thanksgiving Dinners to local firefighters as well as those staying at the Ronald McDonald House. On Monday, November 21, Alstott along with his wife Nicole and three children, will deliver full Thanksgiving meals to 30 fire stations at 28 stops which will include: all 13 St. Petersburg Fire & Rescue Stations, The Treasure Island Fire Department, both St. Pete Beach Fire Stations, all three Lealman Fire Stations, all three Pinellas Park Fire Stations, The South Pasadena Fire Department, The Gulfport Fire Department, all four Seminole Fire Rescue Stations and The Madeira Beach Fire Department as a way to thank the local heroes that will be on duty Thanksgiving Day. The shift accepting the dinner deliveries will be the same shift scheduled to work on the Holiday. 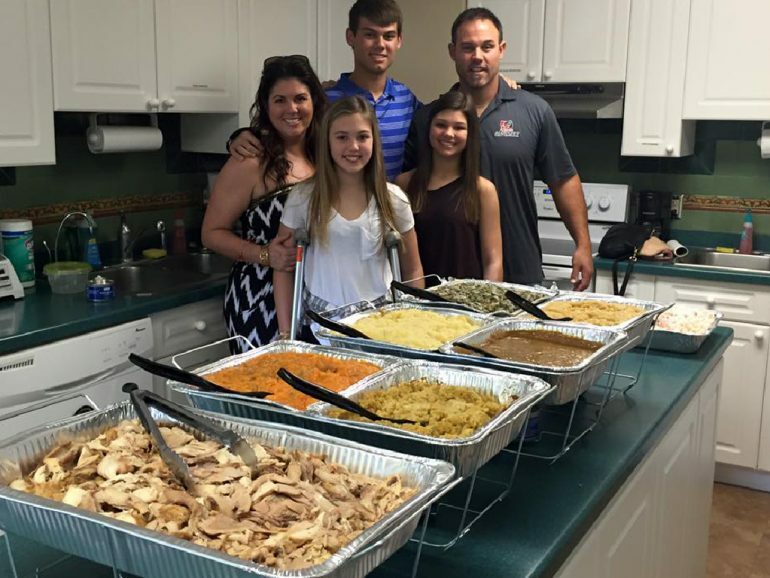 The Alstott Family will continue giving thanks on Thursday, November 24, Thanksgiving Day, when they will deliver a fully cooked Thanksgiving Meal to the families staying at the Ronald McDonald House adjacent to All Children’s Hospital in St. Petersburg. The Ronald McDonald House provides a home away from home for families of seriously ill children receiving treatment at nearby hospitals. The Mike Alstott Family Foundation was formed to allow the Alstott’s to assist others in uplifting the minds, hearts and spirits of families and children on their way to realizing their full potential through various events, assistance programs, and celebrations.